DSCC partnership with UIC’s Division of Audiology will help more newborns with suspected hearing loss receive timely screenings and follow-up services. The University of Illinois at Chicago’s Division of Specialized Care for Children (DSCC) continues to help improve outcomes for Illinois infants and children with suspected hearing loss through timely screening and follow-up services. 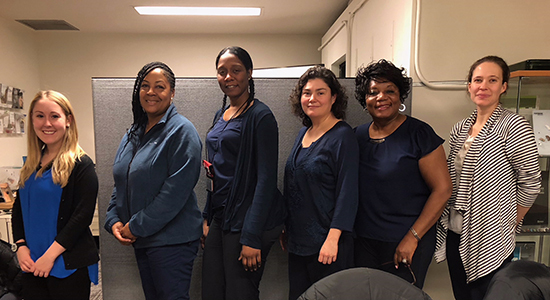 Recently, DSCC’s Early Hearing Detection and Intervention (EHDI) program developed a partnership with UIC’s Department of Otolaryngology (Division of Audiology) to offer training sessions on Otoacoustic Emissions (OAE) screening and provide technical assistance when needed. They start intervention services before 6 months of age. To help Illinois newborns reach these “1-3-6” benchmarks, DSCC receives a grant from the federal Health Resources and Services Administration (HRSA). HRSA funds are used to promote screening of newborns to detect hearing loss, timely diagnostic evaluation and early intervention to lessen the effects of hearing loss on language acquisition among infants and young children. DSCC is providing a part of these funds to the Division of Audiology to train public health nurses from the Chicago Department of Public Health and other county health departments and home visiting programs on the use of OAE screening devices. A “pass” result means that the child exhibited normal hearing in both ears at the time of the test; it requires no further testing in an otherwise healthy infant without any risk factors for hearing loss. A “refer” result means that the child did not pass the hearing screen in one or both ears. A refer result does not mean that the newborn has a hearing loss but rather that additional testing is needed. The UIC Division of Audiology is an expert in newborn hearing screening, diagnostic evaluation and treatment of hearing loss. DSCC arranged for the Division of Audiology to hold three training sessions in January, March and April 2018 to teach all 27 of the Chicago Department of Public Health’s public health nurses about newborn hearing screening and the proper use of OAE screening devices. In addition, the Division of Audiology will continue to train staff from other local health departments or home visiting programs in Illinois that are in need of training for new employees or seeking refresher training. Hearing loss is an eligible medical condition for our program, which supports children with special healthcare needs and their families and connects them to services and resources. DSCC served more than 2,000 Illinois youth with hearing impairments during fiscal year 2017. DSCC’s EHDI program expects that this partnership with the Chicago Department of Public Health and the UIC Division of Audiology will help identify more families of newborns with hearing loss and encourage families of children with confirmed hearing loss to seek intervention services to help their children reach their full potential.